Ein Höhepunkt unserer Reise war sicher ein Dorffest in Lingshed, das wir zusammen mit Karma besucht haben. Zum Glück ist der traditionelle Tanz nicht allzu komplex, so dass wir uns nicht wirklich blamieren konnten. Die Bilder, die uns an diesem Festtag geboten wurden, werden wohl ewig in Erinnerung bleiben. sind froh, dass wir die Chance bekommen haben, mit ihm und seinem tollen Team auf Reisen zu gehen. Das Auftauchen in unbekannte Höhen und das Eintauchen in eine fremde Kultur ist ein Segen für jeden Menschen, der vom hektischen Stadtleben hierzulande umzingelt ist. Für uns war es eine Reise, in der die Zeit verloren ging, das Fremde sich auflöste und Zufriedenheit der Menschen und das einfache Leben einen ungeahnt bleibenden Eindruck hinterlassen hat. Julley Julley!!! Im Sommer des Jahres 2011 waren wir (zwei befreundete Ehepaare) drei wundervolle Wochen unterwegs in Ladakh. Zum Akklimatisieren in Leh und im Indus-Tal wurden wir von Karma Namgyal, einem ehemaligen buddhistischen Mönch mit perfekten Englischkenntnissen, in verschiedene Dörfer und Klöster begleitet. Hier öffnete er uns viele Türen , in einigen Familien erlebten wir mit ihm die warmherzige Gastfreundschaft der Ladhakis . Im Anschluss an diese Zeit organisierte er für uns ein perfektes Zelttrekking vom Indus – ins Zanskar-Tal. Begleitet wurden wir von 10 Pferden, den Pferdeführern, Koch und Gehilfen. Es war ein 3-wöchiges Trekking mit Expeditionscharakter durch die traumhafte Landschaft Ladakhs. Wir haben Karma als unglaublich fürsorglichen, stets fröhlichen und äusserst intelligenten Guide mit großem buddhistischen Wissen kennen und schätzen gelernt . Jederzeit würden wir wieder mit ihm unterwegs sein wollen…. Wir wurden und bleiben Freunde! The 14 days you guided us through the Ladakh mountain range was way beyond everything we had expected. It was not just the overwhelming scenary of moutain peaks, colors, passes and people you introduced us on our way. It was this extra, unexpected element you addded - your deeply serious and warm caring for us made us feel absolutely safe at any time. By the way, the quality and taste of the menues we had while trekking with you were not matched by any restaurant while travelling in India. Our memories of the time spent with you seem to resist fading - all memories are very clear and shining brightly. We just have to come back some day. A thousand times Thank You for having made this lifetime experience possible for us. 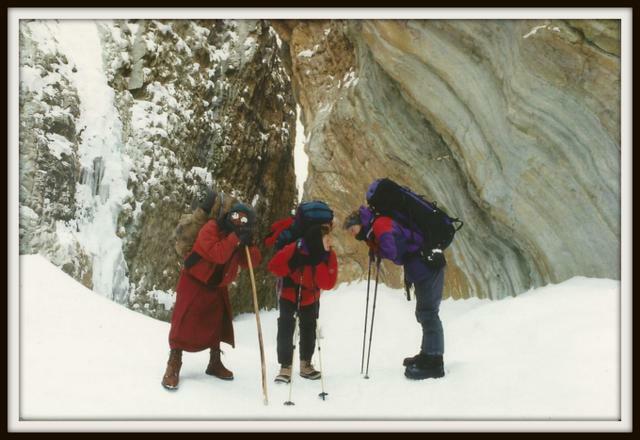 "We trekked twice with Karma, once in the winter (Chaddar to Lingshed), and once in summer (the long approach to Mt. Nun). The first time, we were very impressed by his organizational talents, his knowledge about the country, culture and Buddhism, and his open-mindedness for our "western" way of thinking. The second time, it was to meet again the very good friend he had become to us. 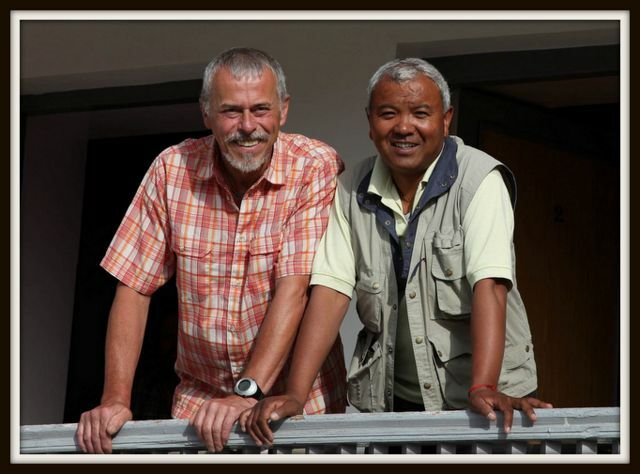 We can highly recommend trekking with Karma -- it will be a unique experience and he will take very good care of you!" "I would do this tour again and again at any time and certainty it was not my last trekking tour with Karma!" "It was for me a spiritual, sensuous and cultural trip which led me travel through the Buddhist part (Ladakh and Zanskar) of the Indian federal state of Jammu & Kashmir. The "Roof of the World" held many highlights for me, the breathtaking flora and fauna, the Ladakhis in their everyday life, and the priveledge to be present in the monasteries while the nuns and monks performed their Pujas (prayers for the wellbing of all beings). The people of Ladakh are incredibly friendly and welcoming and I received through our guide Karma (a former monk from the cloister of Lingshed) deep insights into Tibetan Buddhism and the social environment "behind the monastery’s walls". I was continually invited to share the famous "butter tea" along with the homemade bread of the monks or nuns in their private lodgings and had so many rich personal and private experiences. 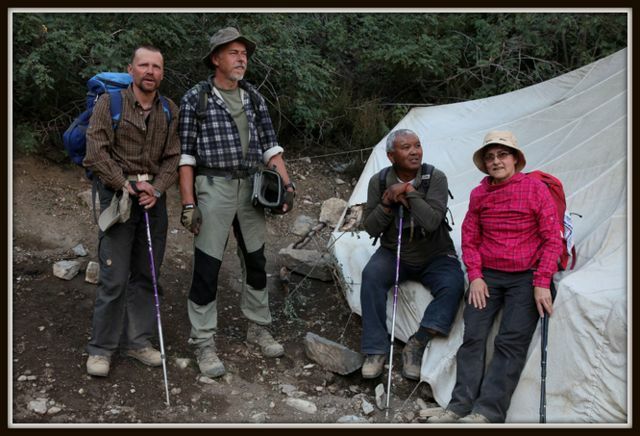 On the trekking tour I was cared for and supplied like at a 5-star hotel. The tents were always already put up when I arrived in the daily camp. Thus I could rest after the trekking day a little bit in the tent or in the food tent with a warm cup of tea, biscuits and cakes and allow me think of/ remember and cherish the fantastic experiences of the day once again. Karma has an open, compassionate heart, he has persuaded me/ us in every regard. He was aware at all times of the potential dangers on the tour and led us always to arrive safely and perfectly content in the camp. The day trips and distances were planned really fantastically and he tuned in to each individual and to the group, and the tempo of each member. The whole organization was perfect. This is of course was also a result of the really great team (horse leader, cook, assistant...) which Karma has put together. The "boys" supplied me/ us on this tour very well and accompanied and supported us every time and made this trip therefore a magnificent experience. Many thanks for everything to all the fantastic people on this tour! On two separate occasions, once in 2005 and again in 2006, we undertook a trekking tour with you, your beautiful wife Dolkar, and your wonderful team. 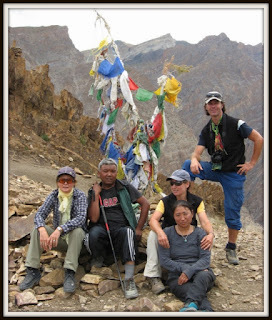 The impressive landscape of Ladakh, the old Buddhist monasteries, the friendly people, your wonderful organization and not least yourself, with your friendly and lovable nature, have made every trekking tour a very special experience. Thank you so much for this wonderful time in Ladakh. We can highly recommend to anyone a tour with you. Since we first met we have shared a deep friendship with you and your family and we hope that we can once again, as soon as possible, come back to Ladakh. It was for me a spiritual, sensuous and cultural trip which led me travell through the Buddhist part (Ladakh and Zanskar) of the Indian federal state of Jammu & Kashmir. 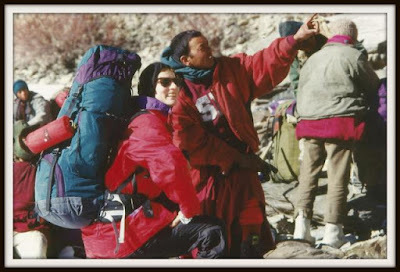 The "roof of the world" held many highlights for me, and thus I could accompany beside the breathtaking flora and fauna also the Ladakhis in her everyday life and might be present in the monastrys by the nuns and monks with her Pudjas. The people have taken me up very guest-friendly and I received through our guide karma (a former monk from the cloister of Lingshed) deep insights into the Tibetan Buddhism and the social environment "behind the monastries walls". I were invited to the famous "butter tea" or also to selfcooked bread of the monks or nuns in her private lodgings and had so also a very private experiences. On the trekking tour I have been supplied like at a 5 star hotel. The tents were always already built up when I arrived in the daily camp. Thus I could rest after the trekking day a little bit in the tent or in the food tent with a warm cup of tea, biscuits and cakes and allow me thinking/ remembering of the fantastic experiences of the day once again. Karma has an open, compassionate heart, he has persuaded me/ us in every regard. He has recognised evry time the dangers on the tour and led us always arrive save and perfect in the camp. The day trips and distances were planned really fantastic and he has tuned individually to the group and the tempo of each member. The whole organisation was perfect. This is of course also depending on the really great team (horse leader, cook, assistant...) which Karma has put together. The "boys" have supplied me/ us on this tour very well and have accompanied and supported us every time and have made this trip therefore a magnificent experience. 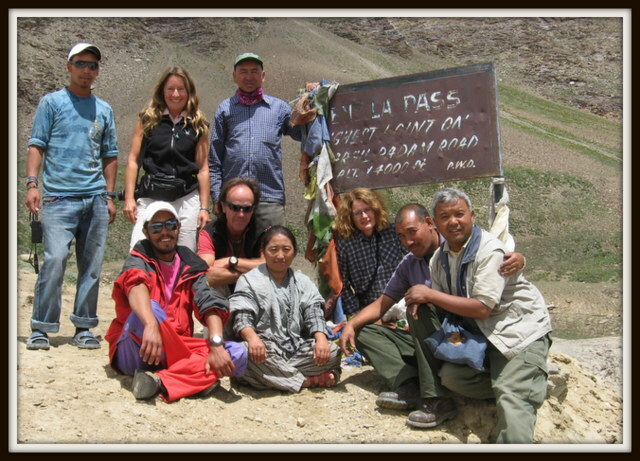 I would do this tour again and again at any time and certainty it was not my last trekking tour with Karma! Thank you so very much for your kind words. Trekking with you was wonderful and becoming friends even more important. I hope to see you again soon! 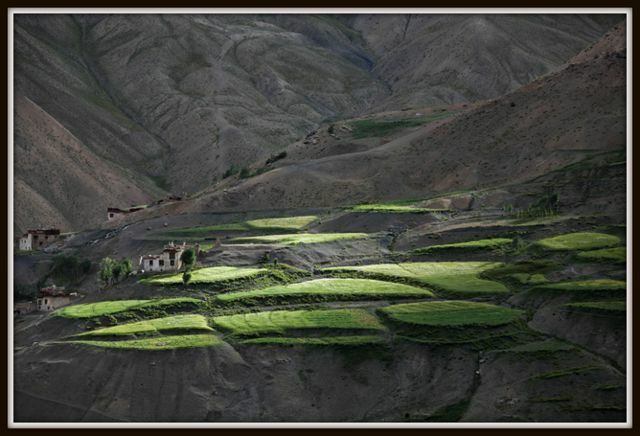 Ladakh will be waiting for your next visit! We´ll meet again, my friend!